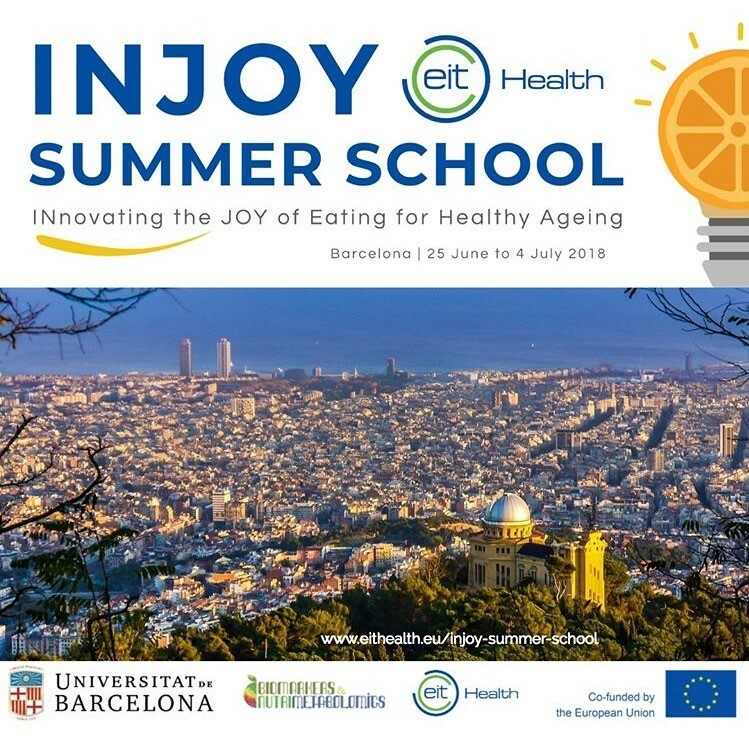 Angelika Mantur-Vierendeel participated in a 10-day summer school during June, organised by the University of Barcelona (ES) and EIT Health. The course was designed to help entrepreneurs, intrapreneurs (in-house innovation managers), and researchers develop novel business solutions empowering citizens to adopt eating behaviours that support healthy ageing. During this intense training, students had an opportunity to participate in scientific sessions, food-innovation workshops, theoretical and practical business sessions, site visits, and listen to ‘influencer’ talks similar to TED. The schedule was designed to combined sessions on nutrition with business development, which allowed participants from different backgrounds (nutrition, research, economics, business development) to better understand one another and how nutrition might be combined with entrepreneurship to generate new ideas. The scientific sessions helped deepen knowledge about nutrition, but also allowed participants to go back to basics and learn new content from a variety of case studies. There was a good dose of business development theory for those without this kind of background, and plenty of practical classes with case analysis to complement the theory. To enrich the training experience, there were excursions to innovative culinary centres and businesses in Barcelona, where students had a chance to understand how real businesses can support healthy living. Participants also had an exclusive opportunity to visit the Alicia Foundation - a centre devoted to technological innovation in cuisine, the improvement of eating habits, and the evaluation of food heritage. In a culinary workshop, students had to cook different meals using innovative technologies, which allow preparation of foods with altered textures. For example, fish and chips can be blended (homogenised) separately and served traditionally, as fish and chips, but allow those with dysphagia to enjoy food they otherwise are unable to eat because of the risk of choking. To ensure the knowledge gained could be put to good use in the future, participants also worked in group projects, translating ideas into sustainable business models. This helped develop and reinforce new skills in identifying and growing business ideas and assessing opportunities for sustainable business models to promote healthy living. By completing this summer school, Angelika has more experience in how SMEs are finding business opportunities on the food, nutrition and health sectors, which – in turn – helps EuroFIR understand better the needs of current and future members and clients.